The role of the chief marketing officer (CMO) has become considerably more technical in the digital age, and now requires close coordination with the chief information officer (CIO). 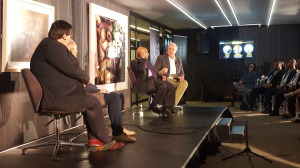 Popimedia’s CMO2020 initiative, intended to launch the conversation on how CMOs can respond to this disruption, kicked off on Tuesday, 9 May. media update’s David Jenkin was at The Mesh Club in Johannesburg for the occasion. Jeremy Maggs took on the role of master of ceremonies for the morning, with a programme that consisted of two panel discussions pitting CMOs against CIOs, and a presentation by Hans Zachar, managing director of Accenture. Zachar presented an overview of the business landscape in relation to digital transformation. Every business is now a digital business, he said, and the pace of change has been increasing dramatically. Zachar used to speak about a five-year horizon, but now the same scale of change occurs within twelve months or less. The first panel discussion consisted of Howard Fox, commercial director at The Gordon Institute of Business Science; Alessandro Colafranceschi, former head of Standard Bank Digital Banking; and Marlon Moodley, managing director of B2HA ICT Advisory. The debate centred around the way in which businesses should be leveraging technology and data in the marketing space, and where the responsibilities lie. Moodley said, “CIOs are actually the guys that have to deal with the discipline around tech – how do you manage data? How do you make sure that it doesn’t fail? The CMO, on the other hand, is the guy who is actually pushing at the cutting edge, trying to create new value streams for the business.” It is therefore necessary, he continued, to find balance and discipline in execution in order to drive the organisation forward. Moodley raised the point of data privacy, and how, in spite of the amount of data available on customers, they are often still treated as numbers rather than people. Additionally, marketers needed to be mindful of incoming legislation such as the POPI Act, which will make the misuse of such data a criminal offence. Fox said, “As a marketer, I was trained classically that if you were going to advertise you were interrupting someone’s reading or their viewing, and in return for their time you had to add value. I think we’ve lost that concept. We’ve decided that because we can, we have the right. Because I can address you by name and I know that you eat x, y, and z on a Thursday, I have the right to do x, y, and z.” He is concerned, he stressed, about the way marketers seem to have lost that respect for consumers’ personal space. Colafranceschi said that marketers need to listen more, as they are in a conversation. On social media there are hundreds of thousands of conversations through which one can gain insights. Fox said that marketers have been forced to listen, which is a huge positive. Although social media is dominated by negative conversations, consumers now have a voice not interceded by a research company as it once was. Concluding, Colafranceschi said that the problem is that marketers are in love with creative things and ideas, while IT people are in love with technology, “… but we are missing the point. This story is about customers, about consumers, not about technology or ideas, but needs, and what matters to people.” He added that the two sides are not converging, and the debate has a long way to go. The second panel discussion consisted of Popimedia’s co-founder and chief technology officer, Gil Sperling; director of digital transformation at Karabina Solutions, Dave Ives; and Angus Robinson, head of mobility and innovation at Native VML. Maggs steered the discussion toward where the previous debate had ended, on the point of bridging the gap between the CIO and CMO. Ives said, “The creative space is wonderful, but landing it in a business is really hard. So you can’t have someone who’s so about keeping the lights on and governance and control, thinking about how to change the business process.” CIOs don’t have a very good understanding of the business and the business process, he explained, and they need to be helped in that space, whereas the CMO is trying to change the business. Sperling described such a role as requiring a unique individual, but he emphasised that it was important not to silo those two sides of the business. Leadership becomes a key point, as Robinson pointed out, since it falls on leadership to align the business along a single purpose and vision, a point Sperling echoed. For more information, visit www.popimedia.com. Interested in reading about how the CCO's role is changing? Read our article Chief communications officers on the front lines of change.